Public Artwork "Feather Point" in Dublin's Thaddeus Kosciuszko Park to be Dedicated Sept. 19, 5 p.m.
Public Artwork "Feather Point" in Dublin&apos;s Thaddeus Kosciuszko Park to be Dedicated Sept. 19, 5 p.m.
DUBLIN, Ohio— (Aug. 21, 2017) Dublin Arts Council (DAC) Executive Director David S. Guion announced today that Feather Point, by Cleveland-based artist Olga Ziemska, Dublin, Ohio’s newest commissioned large-scale permanent public artwork, will be dedicated on Tuesday, Sept. 19, 2017 at 5 p.m. in Thaddeus Kosciuszko Park, 4444 Hard Rd., Dublin. 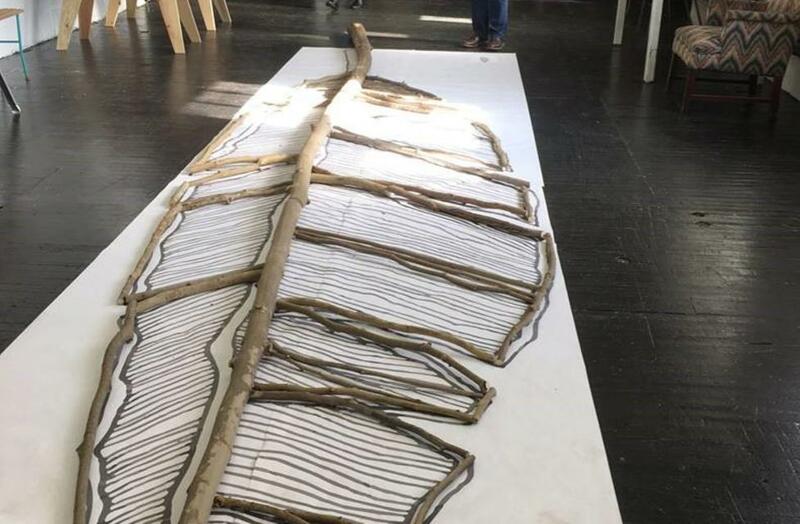 “Feather Point” is a 20-foot-tall stainless steel sculpture cast from trees and branches reclaimed from the site by the artist and a team of community volunteers. The subtly lit sculpture will be visible from the intersection of Hard Rd., and Riverside Dr., in Dublin. The dedication event will feature insightful comments from the artist, authentic Polish refreshments and families of the Polish-American Club of Columbus in traditional dress. The artist’s site-specific proposal takes inspiration from the Coat of Arms of Kosciuszko’s native Poland and finds commonality with the headdress of Bill Moose, known as the last of the Wyandot American Indian Tribe to have lived in Ohio. Kosciuszko was a military engineer who came to American in 1776, becoming a hero for his role in the Revolutionary War. Ziemska has completed public artwork commissions both nationally and internationally, most recently in Italy and Romania. She is the recipient of many prestigious grants and awards, including a Fulbright Fellowship in 2002 and a Creative Workforce Fellowship in 2009 and 2013. Ziemska, the daughter of Polish immigrants, was born in 1976. She received a Bachelor of Fine Arts from Columbus College of Art and Design in Columbus, Ohio and pursued Master Studies in Sculpture at the Rhode Island School of Design, Providence, R.I.
Ziemska’s proposal was selected from a field of 149 artists representing 37 states. The commission in Dublin represents the twelfth she has been awarded since 2009. The jury included eight members: Peter Kwok Chan, Ph.D., associate professor of Visual Communication Design at The Ohio State University; Curt Gettman, public art contract specialist for the City of Dublin; Dublin Arts Council Executive Director David S. Guion; Fred Hahn, retired director of Parks & Open Space for City of Dublin; Jerry Hayslett, an artist and architectural designer with The Wendy’s Company; Andrea Myers, Assistant Professor of Sculpture at Kent State University at Stark, North Canton; Diane Nance, chair, Columbus Art Commission and director of the Office of Sponsored Programs and instructor of arts administration at Otterbein University; and Polish-American Club of Columbus member, Dublin resident and Poland native Iwona Testani. The Dublin Art in Public Places program, begun in 1988, is administered by Dublin Arts Council and City of Dublin and is funded through an endowment of Hotel/Motel Tax funds from the City of Dublin. The collection includes both large- and small-scale permanent, temporary and interactive installations and is valued at more than $3.2 million. Information about the artists and artwork can be accessed at www.dublinarts.org/publicart, through the international CultureNOW app and national Public Art Archive, as well as through a cell phone tour and an augmented reality experience via the Whereto app. For more information about any of Dublin Arts Council’s programs, exhibitions and events call (614) 889-7444 or visit www.dublinarts.org. Dublin Arts Council (DAC), is located at 7125 Riverside Dr. in Dublin, Ohio. Hours are 10 a.m. - 7 p.m., Tuesday; 10 a.m. – 5 p.m, Wednesday through Friday; and 11 a.m. – 2 p.m., Saturday. DAC is a 501(c)(3) nonprofit organization, supported in part by an annual endowment from the City of Dublin’s hotel/motel tax and the Ohio Arts Council, which helps fund Dublin Arts Council (DAC) and its programs with state tax dollars to encourage economic growth, educational excellence and cultural enrichment for all Ohioans. DAC is further supported by the National Endowment for the Arts, contributions from individuals, corporations and foundations, fundraising events, classes and workshops, gallery sales and in-kind contributions. DAC engages the community, cultivates creativity and fosters life-long learning through the arts. 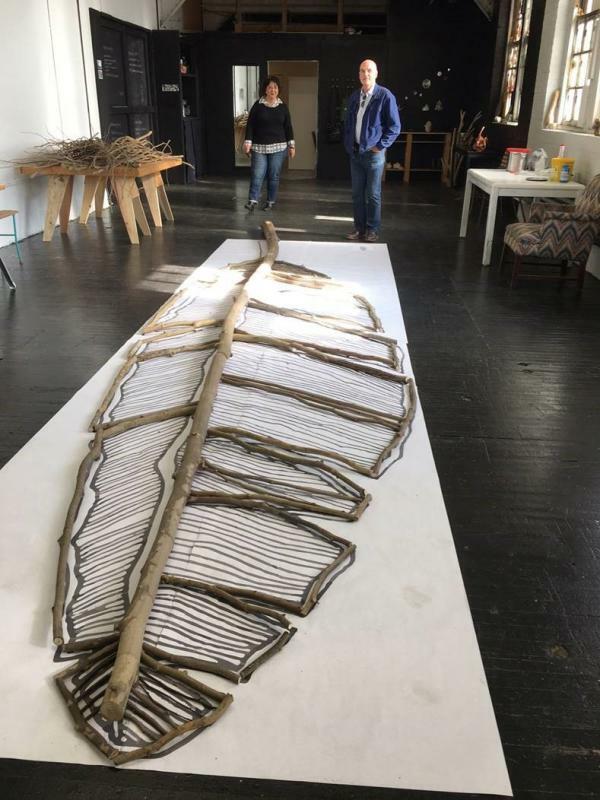 Caption info: Administrator of City of Dublin Volunteer Services Christine Nardecchia and Dublin Arts Council Executive Director David Guion view the “Feather Point” artwork in progress at Olga Ziemska’s Cleveland studio, November 2016. Photo courtesy Dublin Arts Council. 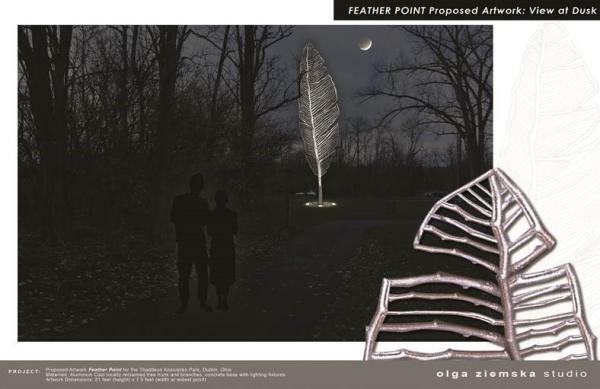 Caption info: Artist Olga Ziemska’s rendering for “Feather Point” which will be dedicated in Dublin’s Thaddeus Kosciuszko Park Sept. 19 at 5 p.m. Rendering courtesy of the artist.